If you're a regular reader of Domestic Sluttery, you'll know that we encourage bakers and chefs of all abilities to have fun in the kitchen. We've even come up with our Baking for Beginners and Sluttishly Simple features if you're short of time, patience or confidence. But what if you really can't be bothered one day? Or what if you're trying to teach especially small people how to bake, and so don't have time to buy and weigh out the various ingredients? Or what if you want to buy an interactive gift for someone who is looking for ways to entertain their little horrors during the long, long six week holiday? 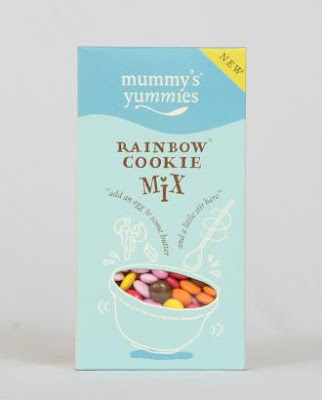 Enter: Mummy's Yummies. 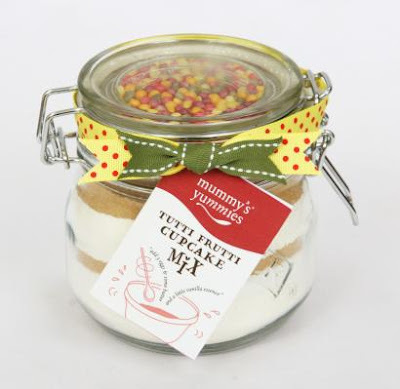 A business founded by busy mum Annie Low in 2006, it provides fat little jars of goodness: all the dry ingredients for a simple baking expedition layered in a jar (you'll need to add butter or eggs yourself), all natural and high quality, and all weighed out and ready to roll with step-by-step instructions. They've got a nice variety, from rainbow cookies to sticky ginger cake to lemon crunch or tutti frutti cupcakes. What you give up in originality you definitely make up for in utter simplicity. The 1kg jars are £9.99 or the 435g boxes are £4.25 from Spirit Boutique. I have to admit I'm a bit torn on these, although I would definitely buy them as a gift for the mothers in my life. What do you guys think: a life-saver, or would you rather be a little more creative?